The 2017 NBA Draft is a mere two weeks away, which means it's time to get familiar with the players who will be shaking commissioner Adam Silver's hand. The NBA draft has either snuck up on you out of nowhere by now, or it’s the only basketball-related thing you’ve bothered to indulge in over the course of a snooze-worthy playoffs. Now that we’re two-and-a-half weeks out from the big night and teams are deep into their predraft evaluations, it’s a great time to catch up and get familiar with this class (or, if you’ve been reading every word of these boards for the last few months, pick up another hobby after you finish this). We’ve expanded this board to 50, with a ton of players moving around thanks to the last month-plus of the process, dating back to the Portsmouth Invitational and draft combine. If you’re wondering whether draft “stock” is real, the answer is a tempered yes—although all 30 teams have different opinions, needs and decision-makers, there’s a lot of recency bias that comes along with draft preparation (which one can argue smart teams really ought to avoid). Players’ bodies of data vary in size and scouts have been doing their diligence for several years in a lot of cases, but things get serious when the top dogs in every front office sit down and start staring at this stuff, and a lot of that starts in March. Naturally, as teams gather information and it begins to travel and circulate, there’s fluctuation when it comes to projection. This board is our best attempt at offering an idea of players’ draft ranges, as well as making pound for pound evaluations and, yes, ranking them. Bon voyage. Dating back to his impressive March, Fox has crept up draft boards, including this one, thanks to his tantalizing athletic ability and all that comes with it. He’s incredibly fast, can generate transition looks by pushing the ball, and has the strength and explosion to get it all the way to the rim and finish. His defensive instincts are also extremely impressive, and the legitimate strengths on both ends are a big part of his appeal. The big question is his jump shot, which doesn’t look broken but must become consistent enough to at least keep defenses honest. He’ll also need to strengthen his lower body as he fills out. With his change of pace ability and passing instincts, some teams prefer Fox’s slash-first game to Lonzo Ball’s measured approach. There’s enough reason for optimism for the Lakers to give Fox a hard look at No. 2. Tatum’s comfort in generating offense and solid range of moves are his calling card, and it doesn’t take a ton of imagination to see him stretching out his range and anchoring an offense eventually. He’s quick and knows how to create space for himself, but is not a leaper who will finish over or around defensive length. It helps that he showed some willingness to diversify his game and look for his shot less over the course of the season. Tatum has never been a great defender despite having the ability to get the job done. The big questions are what he’s doing to help when the ball isn’t in his hands, and whether he can actually become a threat from distance. He tends to be a ball-stopper, and will have to be extremely efficient to warrant that type of usage and also lend himself to winning. There’s both safety and upside in his scoring. An elite, active on-ball defender with a well-developed body and strong feel for the game, Jackson’s diverse play has one glaring hole: his jumper. He shot much better from three as the season went on, but needs some work mechanically to consistently extend his range and become a threat. He’s quick and strong and can get to the basket and finish, and passes the ball well enough to suggest he could ease into lead ballhandler duties down the road. Jackson’s body language and maturity leave something to be desired at times, and he can check in and out of games if he gets frustrated. If the jumper clicks, Jackson could be a lead scorer somewhere, but his more likely outcome is a strong second or third option who impacts the game on both ends. When you cut through the Lonzo narrative, or perhaps the LaVar one, there’s a really talented passer here, but he's certainly not a lock for NBA stardom. We know his instincts as a playmaker are as good as they come, and we know he also has the size and length to spot up off the ball and make an impact defensively. It’s hard to question those intangibles—he naturally makes teams faster and creates easy opportunities for others. What’s worth considering is how he’ll fare when the game grinds to a halfcourt stop (as it often does in crunch time) and isn’t played at his pace. When defenses lock in on him, Ball will have some trouble creating separation for his unorthodox jumper and attacking the basket, and he didn’t put together a great sample in pick and roll situations at UCLA. His best case could make him the best player in the draft, but Ball will face a number of fundamental hurdles to get there. Often undersold in the conversation surrounding the top guards in the draft, Smith is a bit of a throwback to the 2000s NBA (really can’t believe I just wrote that) with his scoring, playmaking and all-around explosiveness at the point. He thrived in isolation situations this season and might be the best one-on-one scorer in this draft, which bodes well for him as a shot creator and presumable offensive fulcrum. He shone at times as a passer but has room to improve in that area, and the story with his jump shot is similar. Smith didn’t play much defense, but has the ability to cut it if he commits. There are fair questions to ask here, but the bottom line is that Smith is a truly gifted player entering a league that favors athletic point guards more than ever. Size and shooting ability are Isaac’s calling card, but the rest of his game requires some projection at the next level—which isn’t necessarily a bad thing in his case. 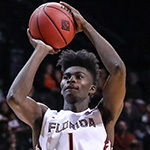 There were nights where he faded into the background for Florida State, but it’s telling that he was often able to contribute on the glass and as a weakside shot-blocker even when he wasn’t scoring. He needs to bulk up considerably, but in an NBA where so much of the game is played in transition, his body may not require a massive overhaul. Isaac stands to improve in terms of aggressiveness and consistency on offense, and some of that should come with time and increased confidence. He’s shown he can put it on the floor, attack the basket and be a threat without the ball in his hands, but his success is largely a matter of how much he’s eventually able to put together on a regular basis. Isaac will need more time than most to adjust, but could become a unique piece if it comes together. 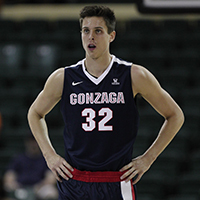 Collins will undoubtedly be a beneficiary of recency bias thanks to his impressive play during Gonzaga’s tournament run. That said, his per-minute stats over the course of the year and his ability to impact the game on both ends place him among the top bigs in the class. Some around the league think his jumper can develop to the point where he can play a stretch role. He’s extremely coordinated and finishes well at the basket, with some ability to put it on the deck and face up. The offensive potential combined with his defensive understanding and mobility suggest he can be a strong two-way contributor in time. An extremely well-built playmaker, developing shooter and aggressive defender, Ntilikina (Nee-lee-kee-na) projects as the top overseas import in this class. He’s extremely long with the size to see over defenses and defend both guard spots. However, he’s still a bit unpolished and will have to grow into the rigors of full-time point guard duties in the NBA, and doesn’t possess the best production sample. Several teams in the Top 10 have done plenty of homework on him, and Ntilikina may not make it past the Knicks or Mavericks. 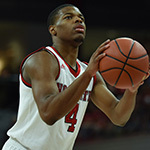 Patton’s offensive efficiency was impressive last season, particularly for a freshman who had barely played any high-level basketball in his life. His fluidity, touch, and passing ability really pops, and he has legit size to play the five, although he didn’t test especially well at the combine. He also has face-up ability, tied to a developing mid-range shot. He needs to improve as a rebounder and polish off his all-around game, particularly on defense, but there could be a ton of reward here if Patton begins to scratch at the upper echelon of his potential. 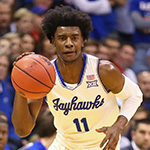 He’ll need to land with a team fully committed to his development, and though he may not be drafted in the lottery, he could be a steal if he slips any further. Whether Markkanen can do more than just shoot the basketball will determine ​the arc of his career—he could be a star if his offense breaks correctly, or could be otherwise be limited to a floor-spacing role rather quickly. We know he can really stroke the ball from deep, and it’s a rare talent for a 7-footer, but we also know he can’t really guard anyone right now. When his shot isn’t falling, he’s not all that useful as a rebounder, rim protector or any other capacity. Markkanen may need to bulk up to the point where he can passably defend big men, because he’s not staying with smaller players. As long as his eventual peak falls somewhere in the middle, he’ll still be a valuable asset a la Ryan Anderson, who can change the geometry of an offense simply by standing in the corner. If he’s more than that, things could get really fun. He could go as early as Minnesota at No. 7. Anunoby has plus-plus upside as a multi-positional defender with crazy length, and though he continues to recover from a bad ACL tear, he shouldn’t fall too far on draft night as long as his medicals are clean. He’s nearly 6’8” in shoes with a 7’2” wingspan and almost 9’0” standing reach, which coupled with his instincts and lateral quickness could make him a terror covering the ball and as a rebounder. He’s got a lot to learn when it comes to creating his own offense, but has shown some ability to hit set jumpers and attack the basket. 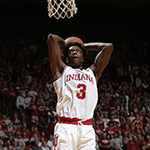 Anunoby is a smart player who rarely forces things, and the sky is the limit as he begins to put his skill set together. Even if he’s just a specialist, he could be a game-changinng one. The mix of elite physical tools and relative youth make Anigbogu one of the more interesting projects in this class. He’s nearly 6’10” in shoes, with a wingspan over 7’6” and a 9’3” standing reach, and was an impact player on defense for UCLA in limited minutes in his lone season. He didn’t score a ton and certainly benefited from playing in the Bruins’ high-octane offense. He doesn’t turn 19 until October and is one of the youngest players in the class, which gives him a favorable-looking trajectory to develop into a mobile rim protector. 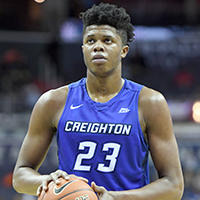 He’s not going to be a go-to option on offense anytime soon, but if you consider the changing demands on centers, Anigbogu’s upside as a defensive anchor and rim-runner is drool-worthy. Kennard has benefited from the predraft process and has a chance to sneak into the back end of the lottery at this point, thanks to his consistency as a shooter and comfort handling the ball. He’s among the top long-range threats in the draft and should be able to operate off the ball and also initiate some offense. Kennard isn’t very long or explosive, which will limit him attacking the basket and creating his own shot and raises obvious questions about his defensive fit. And yes, this is a Duke-white-guy cliche, but it’s legitimately hard to praise Kennard without mentioning his basketball smarts, decision-making and willingness to make small plays that lend themselves to winning. At worst he should be a playable specialist, and at best he could be a difference-maker. A title-winning year at UNC gave Jackson new life as an NBA prospect, and while he may never be a “wow” type guy, he does enough on both ends of the floor to warrant a first round pick. Not everyone is buying his improved three-point shooting and he’s not an above-the-rim type, but he’s talented enough to ably fill a complimentary role on offense if his jump shot sticks. 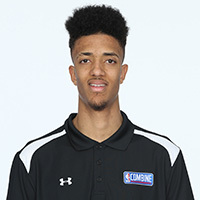 Jackson has enviable length (6’11” wingspan) that could translate into some defensive matchup versatility and has always been a crafty finisher around the basket with a reliable floater, but he’s also pretty thin and could struggle against NBA defenders, particularly putting the ball on the floor. He should do enough things well to stick around for a while. 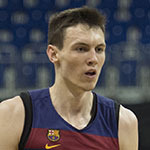 Kurucs looks like one of the top draft-and-stash options in the class, offering a nice blend of size, athleticism and smarts. He’s comfortable on the ball and developing a nice jumper. He appears a little stiff pulling up off the dribble and on the defensive side of the ball as well. His range of offensive skills should still play at the next level. Kurucs is young enough that teams shouldn’t have to rush him to the league, and does a lot of what you want from modern wing player. 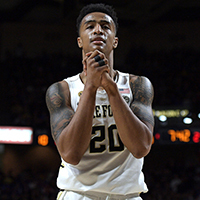 Wilson’s name has been linked to several teams picking in the 20s, and it looks unlikely his mix of three point shooting, size and defensive ability will slip out of the first round. 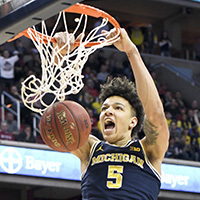 He broke out for Michigan down the stretch as a critical, versatile cog and could play a similar role in the NBA as his body develops. Teams love his ability to switch screens and use his length to stay with different types of opponents, and his shooting form looks legit enough that it’ll play. It’s hard to find guys with his defensive attributes period, so the fact that comes with some palpable offense is gravy. Wilson’s consistency, rebounding and on-court maturity are minor question marks, but there’s plenty to like..
More than just arms and legs (although that aspect of his strengths is substantial), Jeanne more than held his own at the combine, where European players have historically struggled. 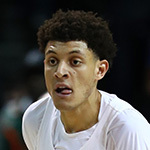 He may have cemented a first-round selection in the process, with his considerable length and bounce exuding upside in addition to a developing jump shot. He’s light on his feet, quick off the ground, and it kind of goes without saying, but he’s enormous. Adding bulk is a must, and he needs a lot of coaching, but Jeanne doesn’t appear to have too many bad habits established, and as malleable players come, he’s extremely intriguing. From a physical tools standpoint, Allen is one of the draft’s most interesting cases. He’s one of the younger players in the class, and has shown some touch around the basket as a legitimate center. He’s about as raw as they come, though, and despite improving over the course of his freshman year, he still has a long way to go. His overall awareness is lacking and he’s probably a few years away from cracking a rotation. You can point to Deyonta Davis last year as a similar study. The Ferguson hype train has slowed a little bit, but he’s certainly talented as a shooter and leaper with a clear path to becoming a contributor on the outside if everything breaks right. He’s got a thin frame and will struggle early on against stronger players, but a year playing in Australia should at least buffer his adjustment a little bit. He needs a lot of work when it comes to putting the ball on the ground and creating his own shot, and whether he can be more than a specialist will be tied largely to that. Comparisons are usually not that instructive, but Adebayo is basically a poor man’s Tristan Thompson. He’s got a great build, works hard on the glass, plays above the rim and doesn’t eat up a ton of touches in order to do his job. That much should translate. He’s made up for a lack of post skills with effort to this point. On the defensive end he’s a work in progress, but has the ability to make an impact protecting the basket with some added polish. If Adebayo’s jumper improves, there could be another level of role player potential here. 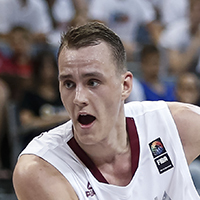 With extreme mobility for his size, Pasecniks has a chance to be one of the first international players drafted, following in the footsteps of Latvian countryman Kristaps Porzingis. He profiles as a guy who can catch lobs, hit open jumpers and affect games with his physical tools. He’s not a total stiff defensively, able to move his feet well laterally and alter shots. From those items alone, it’s pretty obvious that he’s a real prospect. Filling out his frame and adjusting to the physicality of the league will take some time (and he could stay overseas a year or two), but expect to see Pasecniks patrolling the paint somewhere soon. White looked like the best player at the combine and has built a ton of buzz off the strength of his predraft showings. 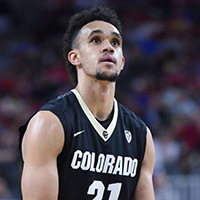 A late bloomer, former Division II All-American transferred to finish his career at Colorado and made waves as one of the most productive players (18.3 points, 4.3 rebounds, 4.1 assists) and top defenders in the Pac-12. He’s quick, decisive and big enough to play both guard positions. White is more scorer than passer at this stage, but will need to grow more comfy off the ball to play the two. Regardless, he’s an increasingly intriguing prospect with one of the draft’s better backstories and a real shot at the first round. This could be a buy-low opportunity for someone. 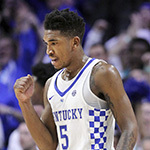 Rabb was a blue-chip prospect and once seen as a potential lottery pick, and despite averaging a double-double saw his stock slip as a sophomore. He’s not an eye-popping athlete but remains a quality rebounder and does enough to contribute on offense. Rabb didn’t take the step forward that many expected, but has the tools to be a useable roll man and finisher, and possibly a threat with his midrange shot. He struggles on the defensive end at times and doesn’t block a ton of shots, but he’s big enough to cut it. His strengths still look tailored for an NBA role, but there’s certainly less starry optimism to be found here. 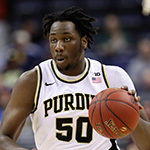 Swanigan became an intriguing pro prospect last season, showing his ability to step out and hit threes with consistency, utilize his length (7’3” wingspan and nearly 9’0” standing reach) on the glass in spite of his height and score around the rim using impressive touch. 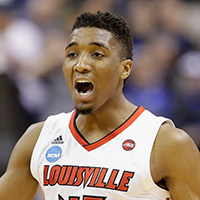 He’s a strong passer and intelligent player who could be a dangerous option rolling and popping as a screener. This is all contingent on him continuing to staying in top shape, which poses a risk in itself, and even then, it’s not clear who Swanigan will be able to guard at the next level. His talent is worth the significant gamble. NBA Off-Season Preview: Will The Post-Bosh Heat Rebuild Or Reload?